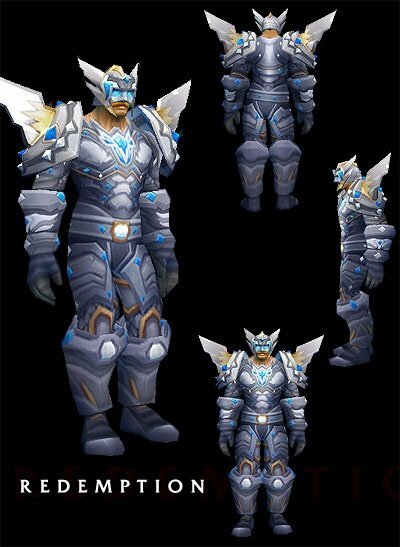 Easily confused for something a Shaman might wear if not for something close to a “classic” winged helmet, the Tier 3 Paladin set departed from the first two tears in providing a new color palette and quite a bit more “bling” than previous sets. Indeed, from the color palette and general silhouette, one could easily make the argument that the Warcraft developer team used this very set as a base for their upcoming tier 4 Shaman set that we have previously ranked. Some will find the jutting rock like shoulders off putting while others such as myself appreciate the attempt to create a unique set and find the bladed spikes a good match with the helmet wings. Your mileage with this set may certainly vary, but the Redemption set provided some much needed diversity with its pale blue aura in stark contrast to tier 1 and 2 which both had a more traditional gold hue. Easily a top 30 set, we welcome the first Paladin entry into our 30 days of diversity settling in at number 24. This entry was posted on May 14, 2011 at 1:07 pm and is filed under General, MMO, Role Playing, World of Warcraft. You can follow any responses to this entry through the RSS 2.0 feed. You can leave a response, or trackback from your own site.